Imitation is the sincerest form of flattery or so they say. 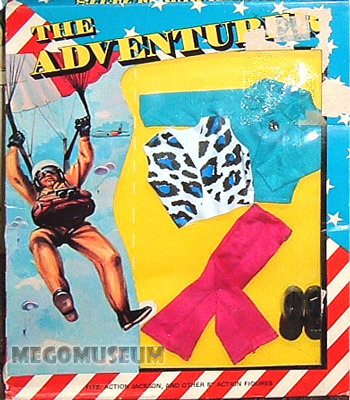 By kick starting the lower cost 8″ revolution with Action Jackson, Mego inspired dozens of other companies to follow suit and in the wake of Mego moving away from Action Jackson, even in some cases supplied the materials. 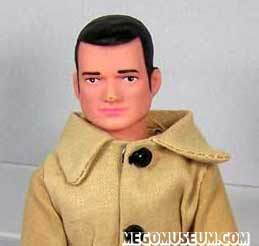 Not much is known about Action Jose but his “Dresses” pop up on ebay from time to time and we’d really like to see what his figure looks like. 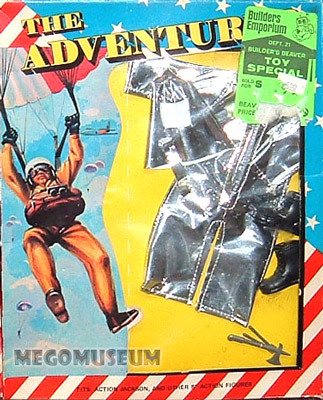 Little is known about this blow molded man of action other than his wardrobe at times is comprised of many Mego Action Jackson sets, several of the adventurer sets are original but many (like the one he is wearing in the photo) even have Mego marking on them. This is likely the result of overstock in Hong Kong. 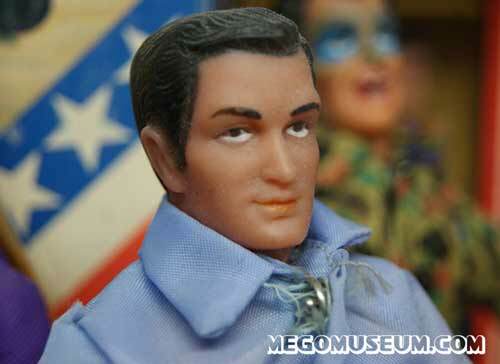 Close up of The Adventurer’s beefy visage, this headsculpt was used in the UK as the face of Tommy Gunn and in the US, he was Mego’s original Fighting Yank! 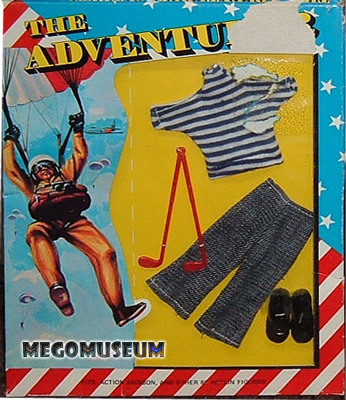 Below are just a few of the Adventurer sets found, a fishing set (identical to Action Jackson) is also known to exist. 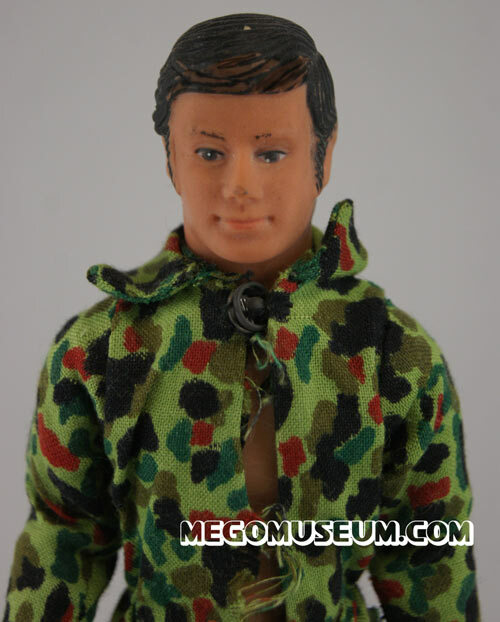 One wonders if the new outfits were from a cancelled second wave of Mego Action Jackson outfits. Note the appearance of the mythical “Peter Parker Camera” in the photographer set, also notice the outfit, it’s incredible. 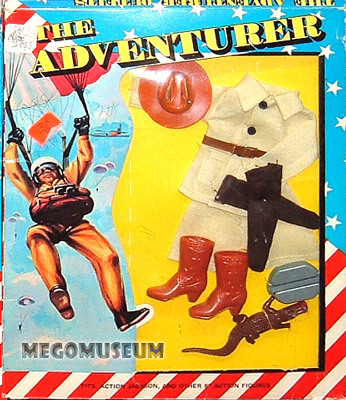 In the early 70s, rival toy manufacturer Azrak Hamway copied a lot of Mego’s moves including following them into the market with their own line of licensed Monster dolls. 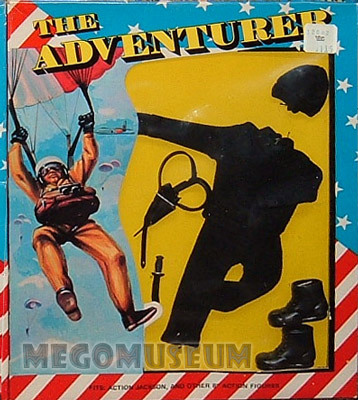 The Action Jackson formula was exempt from this treatment and AHI dubbed their version “Adventure Man” a lower cost line of figures that came garbed in a variety of outfits rather than selling them individually. 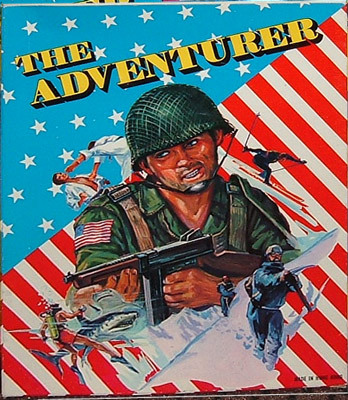 In addition to the generic Action Jackson formula, the Adventure Man line took to copying the popular Gabriel Lone Ranger series as well. 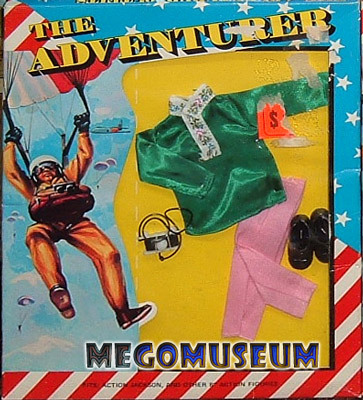 This image comes courtesy of the amazing Megolike.com visit their AHI section for more info on Adventure Man. 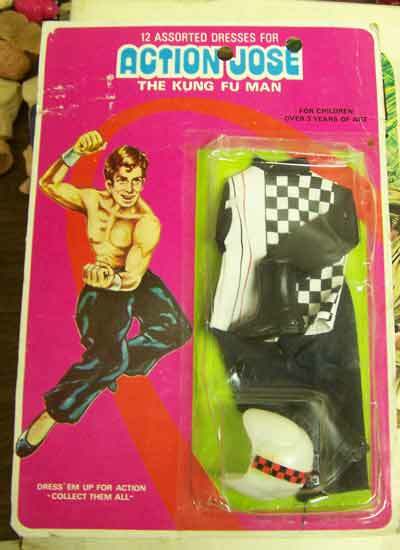 While many of the figures here were created in Hong Kong to sell the Action Jackson tooling, Captain Eagle may be the only figure on this page produced to help sell Action Jackson outfits. 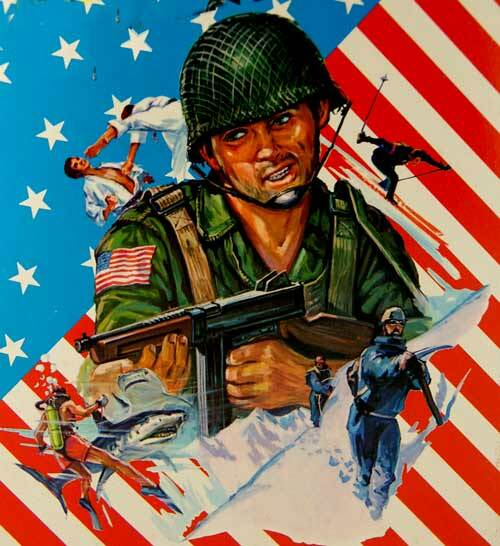 In a “razors and razorblades” situation like Action Jackson, it’s very hard to sell razor blades (in this case boxed outfits) when you are all out of the razors (figures) themselves. 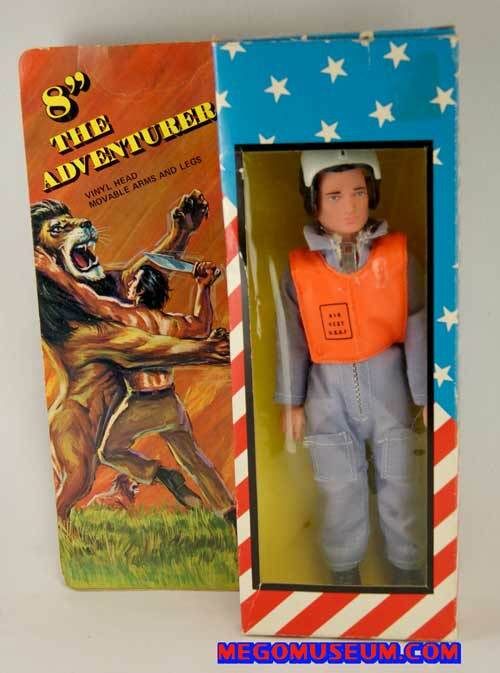 Thus, Captain Eagle was born, this eight inch wonder was marketed in his own polybag but he is best known for being shrink wrapped to Action Jackson sets and being marketed as AJ himself. 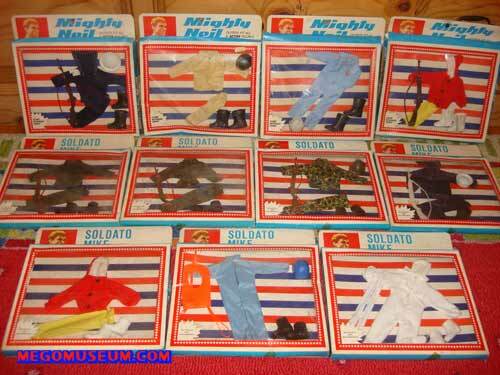 A similiar megolike figure was produced to help sell Matchbox Fighting Furies figures. 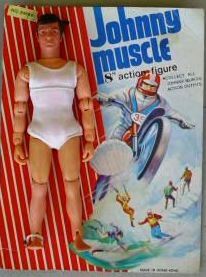 Johnny Muscle was produced by Tong, well known for also releasing the AHI Action Apemen. Outfits are believed to exist as well. 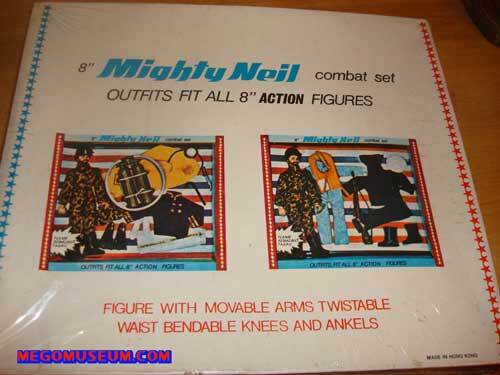 Depending on the country Mighty Neil AKA Mighty Gary AKA soldato Mike was a series of 8″ figures and outfits marketed by Mortoys (Mort Alexander Ltd.) Depending on the character, the figure either came on an AHI body (like these Neil sets pictured here) or on a body very similiar to Amigo complete with bendable arms. 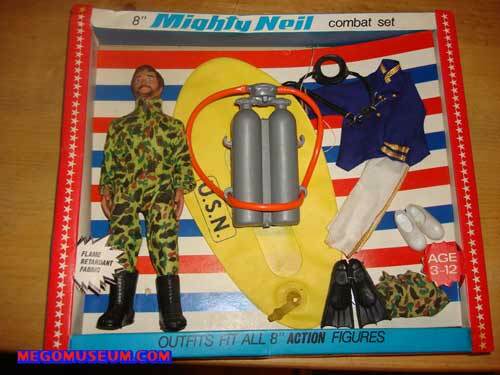 Whatever the case, it’s obvious Mortoys had some connection to AHI. 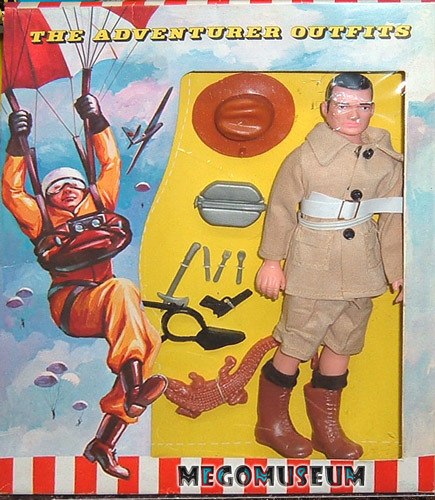 Thrill Seekers was produced and marketed in the UK by Lincoln International, best known to Mego collectors for their line of Monster Figures. 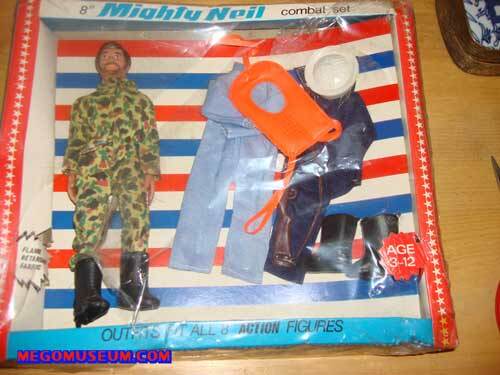 The head were also used for Mort Toys “Mighty Gary” although the body is Lincoln’s standard. 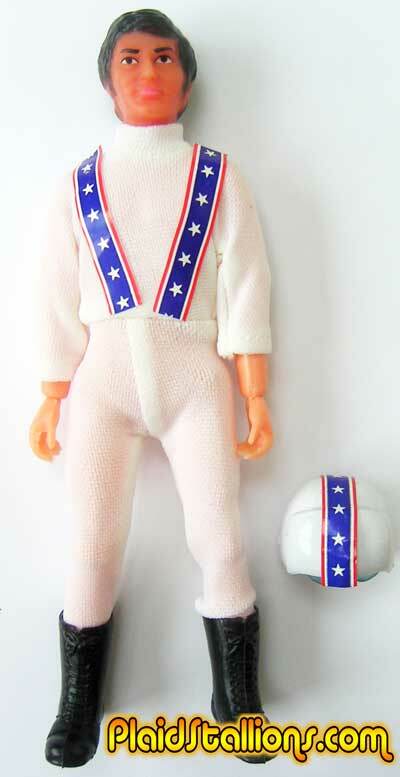 Many of the Thrill Seeker’s accessories are clearly marked “Mego”, the helmet on the Evel Knievel clone here is actually spray painted white.